In the Capitals franchise history they have lost 78% of their Game 7 opportunities. Caps fans may want to close their eyes and scroll past these stats, but in recent history the Caps have lost Game 7’s to the Flyers in ’08, the Penguins in ’09 and to the Canadiens in 2010. The Bruins on the other hand are the only team to win the Stanley Cup by going to a Game 7 in three of the four rounds of the playoffs last year. As a franchise the Bruins have a 13-11 record in Game 7, but what’s done is done and all that matters is who wins Wednesday night. Boston will want to get the first goal seeing as they haven’t lost a game in the series when they’re leading after the first. Bruins are averaging more shots per game, but there would be a bunch more if the Capitals weren’t getting in front of them. The Caps have the most blocked shots in the league with 121 in the playoffs. Home ice advantage may not take full effect in Game 7 as Boston has more goals against than goals for at home. Only two of six games have been won by the home team. Dennis Wideman: The Caps only All-Star representative this year hasn’t gotten off to a great start in the post-season. Wideman lead his team with 35 assists in the regular season, now in six playoff games, Wideman has just one point and is a minus four on the series. Wideman, a former Bruin, hasn’t played up to his potential against his ex-teammates, his play has warranted a cut in ice time as well. In the regular season Wideman lead all skaters in ice time, but now he’s seen his ice time cut by five minutes from his average ice time in the regular season. The Caps need Wideman to find his way, and quick. Tyler Seguin: If it weren’t for Seguin’s goal in overtime in Game 6 there wouldn’t be a game seven, but the problem is this was Seguin’s first goal of the series and only his second point. Seguin lead his team in goals and points in the regular season and now just can’t seem to find the net, but it’s not for a lack of trying, he’s had a team-high 24 shots on net. 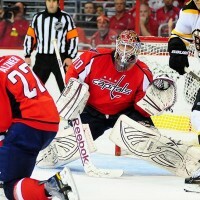 Whether Seguin will be able to turn the tide in Game 7 will all be up to Caps goaltender Braden Holtby. This series has been the lowest scoring of any this year with just 14 goals apiece in six games. It’s also been the first playoff series in NHL history where each of the first six games have been decided by a single goal, a compliment to Holtby and Thomas indeed. Braden Holtby: All season Holtby played just seven games with the Capitals, but in those games he came out with 4 wins and that’s all they will need from him in these seven. Holtby has been the story for the Caps drawing comparisons to Ken Dryden already, but that may all be a wash if he can’t get that final Game 7 win. Holtby has been a three stars selection twice so far in this series, his 2.17 goals against average and .935 save percentage isn’t too shabby either, especially for a guy who’s played just 21 NHL games. Holtby has seen the second-most shots against in these playoffs with the Bruins averaging 36 shots per game, he’s going to have to be ready to play. The play of the Bruins and Caps best players simply hasn’t been there. In this series no player is at the point-per-game mark. Despite the knocks on him, Ovechkin has been the Caps main man with five points and two goals and the other guys – Backstrom and Semin haven’t been bad either. The Bruins can’t seem to get any of their regular point producers going, their highest point getter is second-liner Rich Peverley. The Bruins need to look to the stars if they want to win Game 7. Washington has had the upper hand when it comes to power plays having a 16.7% success rate compared to the Bruins who have the worst power play of any team in the East. The Capitals are giving the Bruins enough opportunities to get their power play going having been punished with 14 more penalties minutes than the Bruins. The Caps and Bruins have had a rough, but clean series so far, averaging 76 hits per game, while also having among the fewest penalty minutes with less than 20 penalty minutes per game.